Handbags are more than just an accessory -- these essential items of a woman's wardrobe showcase her personal style as well. Handbag designer and founder of Blumera Handbags, Mehera Blum, believes that women should have beautiful, versatile bags that combine function with incredible design, and that's exactly what she offers her customers: bags that function as an "expression of who you are." Mehera recently took time from her busy schedule to discuss her inspirations, her designs, and more in this interview. A passionate, energized young woman, Mehera Blum has a love for life that flows into her handbag design. A graduate of the conservatory program at Boston University 's College for the Arts and LAMDA (London Academy of Music and Dramatic Arts), Mehera holds a BFA in Acting and loves creative expression in many forms - including painting and dancing along with design and theatrical arts. Her mother's artwork influenced her at an early age, and Mehera credits her exposure to art as an integral part of her interest in design. Mehera also began traveling at an early age, and she vividly recalls her first visit to India at age seven, when she was awed by the brilliancy of the colors of the country. Later her travels to Indonesia and Bali helped shape her designs as well, the rich artistry of the inhabitants mixing with her artistic upbringing to bring her to the brink of handbag design… and Blumera was born. Blumera bags capture a wonderful sense of both the creative and the functional, as Mehera accurately describes, they are "professional with an edge." They represent a kind of freedom that allows women to choose colors and styles they love while still maintaining an incredibly chic sophistication -- which may be the reason Blumera bags have become staples for celebrities such as Ashlee Simpson, Kate Walsh, and Jessica Alba. Every Blumera handbag is handmade, making every bag a work of art. 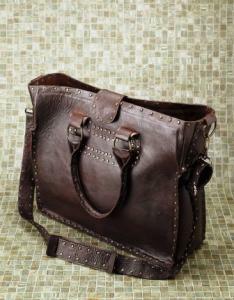 All aspects of the bag, from choosing the materials to mixing the colors to the detail work, are important to Mehera. She puts her heart into the designs, and they stem from a mix of sub-conscious creativity and her wonderful ability to capture even the smallest details. She shares, "Fashion is an art to me….I've even dreamt designs." Captivated by the artistry and culture of the Indonesian people, Mehera has committed herself to helping these people by bringing their handwork to the forefront of fashion. In a country containing areas ravaged by natural disaster, Mehera has made a commitment to the people she's met and worked with, and is dedicated to continuing to supply work to them. Even as Blumera expands, Mehera says "I want to keep that element in place." Mehera takes pride in creating bags of high-quality materials. These designer bags rival Coach in terms of price, and they offer functional as well as attractive design. These are also bags women shouldn't be afraid to use -- they can tolerate a woman's life. 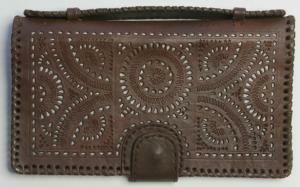 One of Mehera's personal favorites is the extremely versatile Dehlia Clutch/Wallet. This can function well for day or night: either as an individual small purse, capable of holding a cell phone, some make-up, and more, as a travel wallet, or as a smaller organizer or wallet you can toss in a larger handbag. A favorite of celebrity Ashlee Simpson, the beautifully detailed Dehlia is available in a delicate white, a rich earthy brown, or an elegant black. More Blumera Bags, In Stock Now! If you're looking for wonderful designer handbags, now is the time to visit Blumera.com. In addition to the Bhauji and the Dehlia, the following bags are available and are in stock now at excellent prices. The versatile Nadja is a two-handled bag with beautiful braided trim, corner and border studs, and a playful tassel accent. Available in a delicious velvety chocolate, a rich creamy natural, and the designer's personal favorite -- and an excellent choice for spring and summer -- a brilliant yellow, the Nadja offers what Mehera describes as "elegance with a Bohemian edge." Goodbye tote bag, hello Padri! This wonderful, boxy bag offers the perfect handbag for girls who love structured styles. Rounded handles finish off the framing and central stud designs. Dual rings attaching the handles add a modern touch to this fresh bag. Currently available in lemony yellow, eye-catching leaf green, and a neutral white. The Katie's simple shape allows the beautiful artwork of Laurie Blum to shine through. 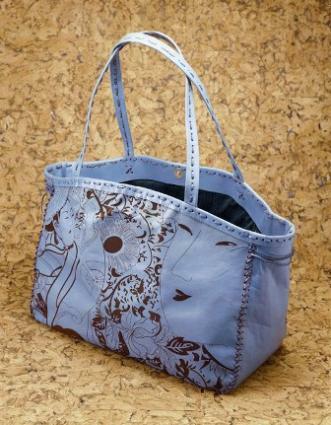 Durably etched on the surface of the bag, the inspiring artwork offers an incredibly unique and beautiful look. Thin, comfortable handles and a stitched leather border finish off this gem. Currently available in a smooth burgundy, a bright magenta, and a creamy turquoise. The Mani is a Blumera bag offering a sense of both strength and femininity. The playful fullness of this Balinese suede bag is tempered with a border of leather with delicate carved edge and small circular cut-outs. Currently available in pink, celery, sky blue, army green, and navy; look for the new incarnation of the Mani in red lambskin coming soon! If you're a woman who loves oversize bags, the Pendu is for you. This roomy bag includes and exterior pocket for extra organization and a stylish look. 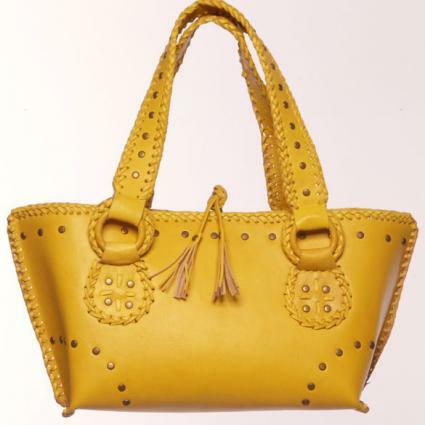 Beautiful tassels also add interest to this sensational bag. Available in a warm, beigy natural and an elegant burgundy. You can easily purchase Blumera Handbags by visiting the website at Blumera.com. Visa and MasterCard are accepted. For further information of requests, you can also e-mail info@blumera.com. A firm advocate of being true to yourself and being your won person, Mehera urges women to "express themselves," and when it comes to fashion, "just go with your gut...taking risks opens you to a whole new world." Don't be afraid to try new colors, she suggests, and instead of just getting what is considered trendy or popular at the time, "look for colors you connect with." Each Blumera bag is unique, just like the woman who wears it. More than just handbags, these stylish pieces offer rich colors and intriguing designs that foster a sense of personal style in women. Being true to yourself, Mehera believes, will result in many "avenues of colorful expression … what a beautiful world, on so many levels." ''LoveToKnow would like to thank Mehera Blum for taking the time for this interview. Check our Blumera.com for more information or to buy the bags.